Half a decade ago, Cloud Computing was the future. Today is the future. If you are a Cloud based solutions and services provider who wishes to explore newer opportunities in the Cloud Computing market, Blue Mail Media’s Cloud Computing Industry Mailing List can be one of the greatest strategic resources for your marketing and sales teams. Since inception, we have created a strong network of data partners across the US, UK, Canada, North America, Europe, Russia, Africa, China, India, Australia and several other countries. This enables us to serve global clients in a localized way. The Cloud computing market is broadly divided into three categories: Infrastructure-as-a-Service (IaaS), Platform-as-a-Service (PaaS), and Software-as-a-Service (SaaS). 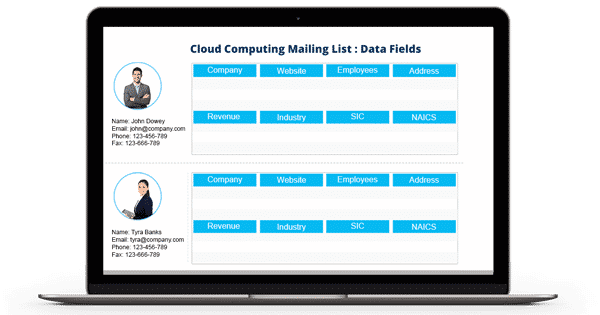 Our Cloud Computing Industry Executives Email Database helps you connect with key industry stakeholders from a 360° perspective. Blue Mail Media’s Cloud Computing Email Database has been prepared with lot of efforts put into data collection from authentic sources, and constant verification and update process. To give our clients more flexibility in terms of availing multi-channel marketing database, we provide pre-packaged List of Cloud Computing Companies as well as offer a customized list based on your marketing specific objectives.